KUALA LUMPUR: Cardiovascular related diseases have remained the leading cause of death of Malaysians for the past 13 years since 2005. Deputy Health Minister Dr Lee Boon Chye said the number of deaths due to cardiovascular diseases had also increased to almost double. “There is a worrying increase of almost double, with 54 per cent of death due to heart diseases, with a total of 13,503 deaths in 2017 compared to only 8776 deaths in 2007,” said Dr Lee in his speech during the launch of Tung Shin Cardiac Care Services at Tung Shin Hospital here. Dr Lee also said that Malaysians were getting heart diseases at a much younger age compared to neighbouring countries and developed countries. The average age of those with heart diseases in Malaysia was 58, whereas in Thailand it was 68, Singapore (61) China (63) United States (66) and Canada (68). He said non-communable diseases such as diabetes, hypertension, obesity, non-controlled hypercholesterolemia and unhealthy lifestyle were the main causes for the increase in cases. Dr Lee said the increase in the ageing population had also contributed to the increase in heart patients with a longer life expectancy. “By 2040, the population of Malaysians aged 65 and above will exceed six million, which is 14.5 per cent of the total population. From this we can expect an increase in heart diseases in the near future,” he said. Coronary heart disease in Malaysia was estimated at 141 cases for every 100,000 citizens, an estimate of 45,684 cases for 32.4 million Malaysians. As for Acute Coronary Syndrome (ACS), which also includes acute myocardial infarction (AMI), also known as heart attack, is at 47.1 cases for every 100,000 citizens; which is an estimate of 15,260 cases for 32.4 million Malaysians. He said for both ACS and AMI proper treatment and intervention was needed to save the lives of the patients for a positive outcome. He also said that 75 per cent of heart disease occurred among males. 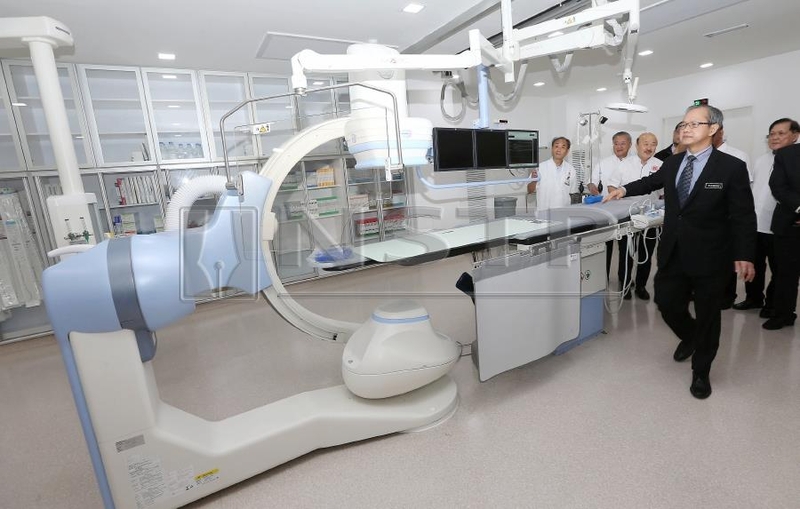 “The opening of Tung Shin Cardiac Care Services is definitely timely and with advanced facilities similar to the ones available in our hospitals here, it will be a good start for us to improve and be more competitive in increasing health quality of the people,” he said.